Details revealed: Presenting the latest updates on Bolton’s, the newest dining spot at Golden Oak. 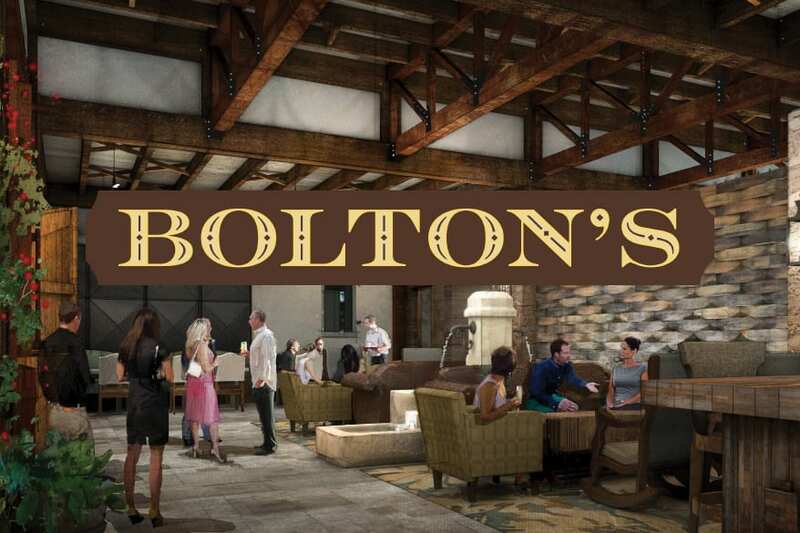 Golden Oak is excited to unveil the name of its newest restaurant at Summerhouse—"Bolton's." Named after Fred Bolton, the lead character in the 1968 classic, The Horse in the Gray Flannel Suit, the new dining spot harkens back to a simpler time when families came together to laugh and be entertained. The community gains its namesake from the majestic Golden Oak Ranch in California where Disney brought his ideas to life, so it's only fitting that its dining spots, Markham's restaurant, Tyler's lounge and, now, Bolton's, are all named after productions filmed there. The peaceful ranch lifestyle that Walt Disney embraced more than a half a century ago sets the tone for the new restaurant's character today. "We recognize that Golden Oak Club members may sometimes be in the mood for a more relaxed dining experience," said Barry Jacobson, General Manager of Golden Oak. "By delivering thoughtful dishes in a beautifully reimagined space and expanded bar at Bolton's, we can continue to cater to residents who want to share a meal together while enjoying one another's company." The addition of Bolton's is part of the current expansion of Summerhouse, the private clubhouse at Golden Oak. The new restaurant will complement Markham's and Tyler's while offering more flexibility within Summerhouse for private events. Featuring an impressive entrance made from oversized barn doors, Bolton's farmhouse-inspired space will welcome Club members with a rustic accent wall made from reclaimed whiskey barrels and a one-of-a-kind vintage water pump. Members can unwind over a handcrafted cocktail, a glass of wine or local beer while enjoying views from the restaurant's floor-to-ceiling windows. With a bounty of locally sourced provisions at hand, Chef Phillip Ponticelli and his team are looking forward in the coming months to culinary interpretations that continue to exceed members' expectations. While the restaurant will continue to serve favorites such as the signature Golden Oak Burger, Buffalo Roasted Rainbow Cauliflower, and Hand-crafted Pastas, the team is expanding the menu to include artisanal pizzas made in the restaurant's wood-fired pizza oven and other delectable creations. "Our culinary team is amazing in their ability to create exceptional dishes ranging from multi-course haute cuisine to comfort foods such as home-style meatloaf and a classic member favorite, Turkey Club, featuring house-smoked turkey and house-cured bacon," Melissa Schreiber, Proprietor of Food & Beverage at Summerhouse, told us. "Whether it's at Markham's, Tyler's or Bolton's, our goal is to ensure a diverse menu prepared with the best available ingredients, offering Club members selections that are truly extraordinary." "Summerhouse has always been a place where Club members love to gather," Jacobson added. "And now, with the addition of Bolton's, we're excited to add a new dimension to their dining experience." Bolton's is expected to open in late 2018 while the full Summerhouse renovation is scheduled for completion in early 2019.